A team doesn't usually like to draw the only team that beat it. But if you're looking at Shippensburg's first-round matchup with Northern York as a disadvantage for the Greyhounds, as their only blemish on the season came at the hands of Northern, think again. Think of it as extra motivation; think of it as reverse psychology; think of it however you want. The bottom line is, Shippensburg wants to win. "For sure, you always want to get back at a team that you lose to," Shippensburg senior Cameron Tinner said. "It's something I really look forward to. When I found out we were playing Northern, I actually got really excited for Friday." The Polar Bears (7-3) will head to Veterans Memorial Stadium to face the Greyhounds (9-1) in the first round of the District 3 Class 4A football playoffs on Friday night. When the teams met in the regular season, Northern escaped with a last-second field goal and a 17-16 victory. But for all intents and purposes, Shippensburg probably should've won that game. It out-gained Northern, 394-147; it punted just twice, compared to Northern's five boots; it managed 20 first downs with only nine for Northern. Moreover, the Greyhounds held a 16-0 lead at halftime. To sum it up, they want this one back. "We want to avenge our loss," Ship coach Eric Foust said. "I do think they're beatable, and I think we should've beaten them the first time. But we made mistakes." That was the difference. One fumble by Adam Houser cost the Greyhounds the game, but since then, Houser has been basically unstoppable, breaking the 1,000-yard plateau in Week 10. And Foust expects that to continue on Friday night. "He's very aware of what happened, and if I were a betting man on Friday night, I would anticipate that Adam Houser comes out as a man on fire," Foust said. 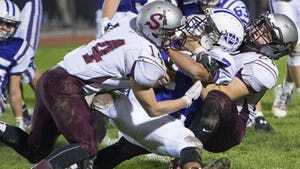 "The game after that against West Perry, he was untackleable for a quarter (147 yards). That was just a show, and I would anticipate something similar to that." With Houser's recent upswing, the Greyhound offense has become extremely well-balanced. It boasts easily the top receiver in the area in Cody Gustafson, who has 56 catches for 1,155 yards. "We have that chemistry and connection," Ship quarterback Carter Van Scyoc said. "For instance, one game, we called an in-route, and he ran a post. But I was able to see that because their safety came up, and I threw over. For our chemistry sake, I see what he's going to run, and that benefits us a lot." Foust said, "Even in games we don't throw much, Cody dictates our offense some because every team is doubling him or finding way to cover Cody with multiple receivers, which is one less person we have to block." Shippensburg's strong defense, which is averaging just 9.9 points against, will once again have to key in on a run-heavy offense. Freshman Kyle Swartz leads the Polar Bears with 717 rushing yards, and dual-threat quarterback Curtis Robison has rushed for 565 yards and thrown for 1,014 more. But the Greyhounds' biggest focus this week seems to be staying true to who they are, and eliminating any hint of a mistake. "Defensively, that (first meeting) was probably one of our better games we played all season," Tinner said. "We just got stuck into some tight situations, and we couldn't finish. Offensively, we were getting down the field, getting inside the 20 and we just couldn't push it in. We have to finish drives." Game data: Northern York Polar Bears at Shippensburg Greyhounds ... Friday, 7 p.m. at Veterans Memorial Stadium ... District 3 Class 4A quarterfinal. Media: Follow @MattBernardini7 and @LindseySquints on Twitter for updates ... Webcast will be available on sesportsnet.com ... Radio broadcast on WIOO (1480 AM, 93.9 FM). Teams: Shippensburg (9-1) is the No. 2 seed, while Northern (7-3) is the No. 7 seed. The Polar Bears won the first meeting, 17-16, but according to Ship coach Eric Foust, the Greyhounds have won 22 straight at Memorial Park. P.O. pick: Ship by 7.